Manuel Torres and Chambacunero on course in the $50,000 Strongid C 2X Grand Prix, presented by Pfizer Animal Health. presented by Pfizer Animal Health. A large and enthusiastic crowd lined the perimeter of the Grand Prix arena to watch as 35 riders challenged Course Designer Jose “Pepe” Gamarra’s track, which at first blush appeared to be big and bold; however, it was the technical aspects of his course that proved to be subtly deceptive. Combinations short to long were followed by those that went from long to short, which required changes in stride that took their toll, as nearly two-thirds of the class suffer jumping and time faults throughout the course. David Tromp of North Salem, New York finished third aboard Beyaert Farm, Inc.’s Casey, while Tracy Fenney of Flower Mound, Texas followed in fourth place with MTM Farm’s MTM Timon. Michael Morrissey of Bradenton, Florida was the fastest of three riders with four jumping faults and finished fifth with his own Crelido. HITS' Lisa Engel, Becki Pitcher of ERI, and Tom Pratt of Pfizer Animal Health, joined by his daughter, Ella, presented the awards to Manuel Torres and Chambacunero, which included a 50 pound bag of Strongid C 2X, a bottle of Sonoma-Cutrer Chardonnay, and a cooler courtesy of Shires Equestrian Products. Exhibitors in Tucson, Arizona awoke to some unusually odd weather on Sunday morning with a dusting of snow on the ground. By 10 am the sun came out and warmed things up, paving the way for another great Grand Prix at the Pima County Fair Grounds. California’s Jack Robson set the course for the feature class and, for the second week in a row, it was Denmark’s Bjorn Ikast leading the victory gallop aboard his own Brave Heart. 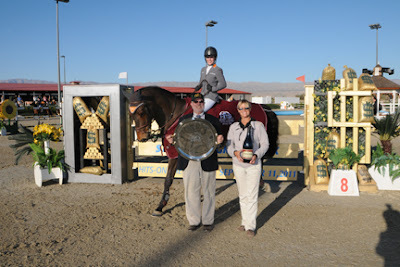 Michelle Parker of San Marcos, California finished in second place aboard her mount Clever, and then placed third aboard Cross Creek Farms, Inc.’s Tocayo. New Mexico’s Elani Rager claimed fourth place aboard Lisa Upplegger’s Castor for their fourth consecutive week of finishing in the top five, while Ikast also earned fifth place aboard Bovee LLP’s Colorado. Bjorn Ikast and Brave Heart on course in Sunday's $25,000 HITS Grand Prix, presented by Pfizer Animal Health, at the HITS Arizona Winter Circuit. Bjorn Ikast and Brave Heart after their victory in the $25,000 HITS Grand Prix, presented by Pfizer Animal Health. The win marked the 23rd Grand Prix victory for Brave Heart. Saturday’s clouds gave way to mild sunny skies on Sunday at the HITS Desert Horse Park in Thermal, California. 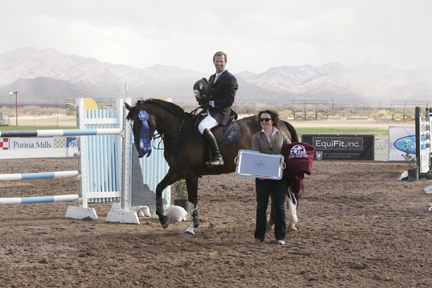 The $25,000 SmartPak Grand Prix, presented by Pfizer Animal Health, capped off an incredible week of show jumping in the desert. 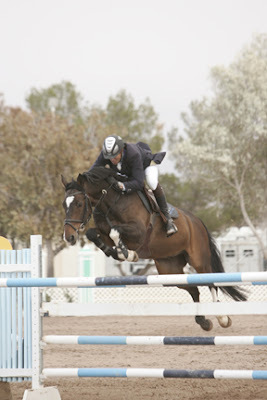 Thermal’s course featured the talents of Marina Azevedo and Flora Baptiston, both natives of Brazil. Course Designer Azevedo mapped out a scopey and electrifying track, while Olympic Course Decorator Baptiston decorated the ring to create an innovative and beautiful landscape for both the competitors and the spectators, who lined all four berms to watch. 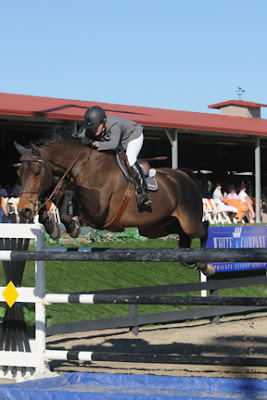 Meredith Michaels-Beerbaum rode Octavia Farms' Lancaster 144 past a field of 44 starters that challenged the first-round course, and then the five pairs who advanced to the jump-off to score her first Grand Prix win of the 2011 HITS Desert Circuit. Sunday's win for Team Germany’s Michaels-Beerbaum, originally of California, will be one that she will remember forever as it came on the day of her daughter Brianne’s first birthday. The decorated equestrian delivered the best birthday present of all when she posted the fastest double-clear round to take home the first-place check. “It will be a day I’ll never forget,” said Michaels-Beerbaum after the class. In the first round, Canadian Olympian Jill Henselwood was third to show and wasted little time bringing home the first clear round aboard Juniper Farm’s George. It took 22 trips for the next clear round to emerge as Azevedo’s track proved challenging. It was Rachel Fields of Woodside, California riding Alex and Cathy Mendez’ Karl Du Chateau who ensured the crowd there would be a jump-off. Henselwood and George were first to show in the jump-off and set the Great American Time to Beat by stopping the clock in 37.674 seconds. Their leading time held until Michaels-Beerbaum and Lancaster 144, with just one rider left to show, rode to the top of the mountain, coming home clear in 36.821 seconds to take the lead and eventually win the blue ribbon. Rounding out the top finishers were Michelle Spadone of Califon, New Jersey aboard Redfield Farm’s Coco in third, Rich Fellers of Wilsonville, Oregon and Harry and Molly Chapman’s McGuinness in fourth, and Fields and Karl Du Chateau in fifth. After the class, Michaels-Beerbaum headed home to Germany for a few days to prepare Shutterfly and Checkmate for the Global Championship which will take place right after HITS Thermal. “I may make it back in time to show in the FEI World Cup Qualifier on Saturday night but I am not sure. 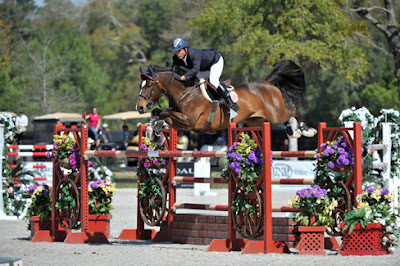 I will be back for the last week where I will show in both Grand Prix classes, including the $200,000 class,” she said. Meredith Michaels-Beerbaum and Octavia Farms' Lancaster 144 scored the blue in Sunday's $25,000 SmartPak Grand Prix, presented by Pfizer Animal Health, at HITS Thermal. Tony Hitchcock and Dawn Van Meenan of HITS present the awards to Meredith Michaels-Beerbaum and Octavia Farms' Lancaster 144. Show jumping at HITS resumes tomorrow at HITS Ocala and Thermal, while action at HITS Arizona will get underway on Wednesday, March 2. 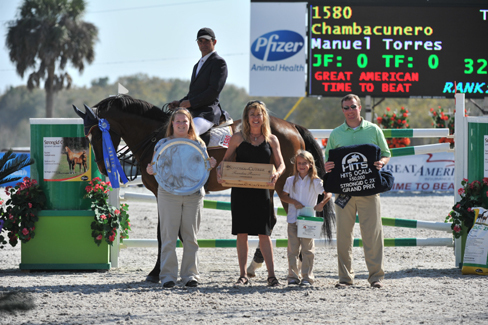 HITS Ocala will host two Grand Prix, including Sunday’s $50,000 Ring Power Grand Prix, presented by Pfizer Animal Health. HITS Thermal will feature three Grand Prix, including Saturday night’s fourth and final $50,000 FEI World Cup Qualifier, while HITS Arizona will host another $25,000 HITS Grand Prix on Sunday, March 6.